When live and dead root mass were combined, a strong positive relationship was observed with the GPR data (r = 0.80). The high proportion of buried organic debris at Sanderson limits the utility of the technique to detect live roots. At KSC the correlation between GPR and live roots was much better (r = 0.84). The Sanderson findings highlight the fact that presently, it is not possible to separate live and dead buried biomass. At KSC, dead biomass represented only 13 percent of the total buried biomass which clearly enhanced the accuracy of root biomass using GPR. When the live and dead root mass were combined at KSC and compared to GPR-derived predictions the correlation was excellent (r = 0.82). Previous forest studies minimized the importance of understanding the reflectivity of organic debris; it was thought that dead roots rapidly took on dielectric properties of the surrounding soil (Butnor et al., 2001). The issue of organic debris never came up at a site in Bainbridge, Georgia, which had been used and plowed for decades in traditional agricultural systems, exposing any residual debris to oxidation (Butnor et al., 2003). 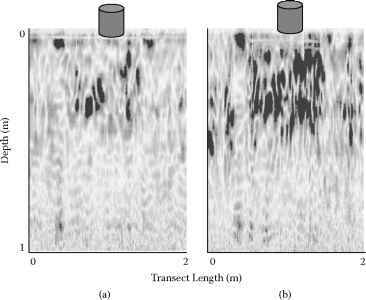 GPR has subsequently been used to detect dead root fragments in peach orchards (Prunus persica) to specifically identify and quantify organic debris that harbors harmful fungi (Armillaria sp.) that could be detrimental to new plantings (Cox et al., 2005). At Sanderson, the problem of interfering organic debris resulting from site preparation was likely exacerbated by the preponderance of saw palmetto which is decay resistant compared to other forest slash. FIGURE 30.4 Example of antenna defocusing near the trunk of a loblolly pine caused by thick, dry pine straw, 20 cm deep on pine root discrimination (a) compared with enhanced discrimination when the pine straw is raked away (b). 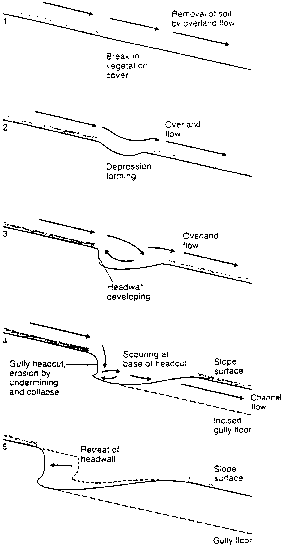 1500 MHz antenna, it created an offset between the antenna and the soil surface which was largely air filled and degraded the ability to detect roots (Figure 30.4). If litter depth was uniform across all treatments, the defocusing effect could have been mitigated. However, because the experimental manipulations of tree genetics and fertilizer application resulted in differential litter depth (5 cm versus nearly 20 cm of dry newly deposited pine straw), the differences in root mass could not be assessed. The Sanderson site was expected to be ideal for radar studies, but several unforeseen complications negated the quantitative value of the GPR-derived estimates of root mass. The study was important to highlight potential sources of data clutter in forests. The soil core calibrations at KSC became very useful for analyzing the effect of elevated atmospheric CO2 concentrations on below-ground biomass accumulation in the scrub system. Elevated atmospheric CO2 concentration has been experimentally increased at the KSC site using open-top chambers (OTC) since 1996 (Day et al., 2006). CO2 enters the chambers through air blowers and circulates throughout the chamber and exits at the open chamber top. During the ninth year of the CO2 study, sixteen OTCs (eight elevated and eight ambient CO2) were surveyed with a 1500 MHz antenna. The soil core calibrations at KSC (described earlier) were used to convert GPR index values from the OTC scans to mass of belowground biomass per unit area g m2. Significantly greater coarse root biomass was present in plots treated with elevated compared to ambient CO2 (p = 0.049) (Stover et al., 2007). The scrub ecosystem is dominated by large belowground structures such as stems, lignotubers, and burls that serve as carbohydrate reserves that are critical during regrowth following a disturbance in this fire-controlled system. Approximately 86 percent of total biomass was allocated belowground in the scrub system, suggesting greater carbon sequestration in larger belowground structures under elevated CO2 conditions. Similar to Sanderson, the KSC site was unable to adequately distinguish and separate live and dead root mass within the data. FIGURE 30.5 Visual correlation between ground-penetrating radar (GPR) data and coarse root excavation pits. Large roots spanning the entire length of the validation pit were most likely to be observed in the GPR data. Each GPR data image (left) represents a "slice" of the three-dimensional profile at the appropriately correlated depth with a viewing depth of 15 to 20 cm. scrub-oak site. The data were processed with RADAN software which permits intersections of the X-Y scans to be interpreted as three-dimensional volumetric data. Resulting three-dimensional models were compared to photographs from the excavation for verification of spatial orientation and distribution of roots (Figure 30.5). Smaller objects that were parallel to one another or that were "shadowed" by neighboring root were typically masked or grouped together as a single object. Larger roots having sharp or unique angles were easiest to identify in the data-image comparisons (Figure 30.5). Initial determination of root architecture was limited by lack of adequate sample resolution (i.e., less than 1 cm width) and accurate methods to quantify the object size in the three-dimensional models. However, these results indicate with further refinement that spatial distribution can be quantified under the sandy soil conditions, thus elucidating environmental changes in root deployment, carbon storage and sequestration, and resource foraging in the scrub ecosystem.